One of the key enigmas of cultural history has been the identity of a sacred plant called Soma in the ancient Rig Veda of India. 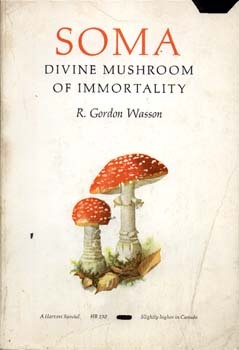 Mr. Wasson has arounsed considerable attention in learned circles and beyond by advancing and documenting the thesis that Soma was a hallucinogenic mushroom-none other than Amanita muscaria, the fly-agaric that until recent times was the center of shamanic rites among the Siberian and Uralic tribesmen. In his presentation he throws fascinating light on the role of mushrooms in religious ritual. A section on the post-Vedic history of Soma is contributed by the Sanskrit scholar Wendy Doniger O'Flaherty. "Mr. R. G. Wasson advances a revolutionary hypothesis on the nature of Soma, the implications of which are so widespread that ethnologists cannot leave the task of communicating it to Indian specialists only....Mr. Wasson's work establishes, in our opinion convincingly, that among all the candidatures put forward for representing Soma, Amanita muscaria is by far the most plausible." "The argument of Wasson's Soma is as lucid as unanswerable; the illustrations are wonderful, the quotations are numerous and telling. I congratulate him on his feat." "The careful scholarship of the dedicated amateur mycophiles R. Gordon Wasson reads like an exciting scientific detective story. Moreover, his willingness to pursue the quest through the wide range of linguistics, archeology, folklore, philology, ethnobotany, plant ecology, human physiology, and prehistory constitutes an object lesson to all holistic professional students of man."